The road forks. The wind shifts. 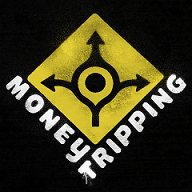 Moneytripping has evolved to become more politically charged. I’m still eavesdropping on conversations about the dollar and spending my afternoons in bank museums but more broadly, I’m covering the political and economic culture in the U.S., the anthropology of American interactions with the economic system. It’s political economy, the interplay between economics, law and politics, and how institutions develop in different social and economic systems, tailored for the era of globalization. My nature pulls me towards the edges, in the direction of alternative lifestyles that don’t much care for the mainstream’s worship of capitalism’s ravenous effects. We’ve become a society only interested in competing, not for the love of the game but only to win, in hoarding our kindness, wealth and success, or the love of ourselves and our traditions. In an effort to stay on top, in an effort to be self-righteous, we hide these things, keep tabs on these things, lock and chain these things so that others will not take. There’s nothing wrong with shooting for the moon, but in how America measures success today, with six figures of data sitting on bank ledgers, power and fame, the moon isn’t attainable for us all. And those that reach the moon become more reluctant to share the sky when our society makes these notches the only ones worth putting on your belt. There’s capitalism’s growth for a few and then there’s the sustainable growth of countries not competing in the “Greatest Country in the World” race. And those, my friends, are the ingredients for an outcome, the fall of ourselves, the fall of our success and wealth, the fall of America. Maybe I’m tracking the tumble, but I’d prefer to sound the alarm in front of it. And I hope Moneytripping can be used to find options when unchecked capitalism doesn’t keep us safe and warm anymore. Would I be able to do this without a safety net? No. I have friends and family around the country that will lend me money if the engine blows in the Escape, that will give me shelter once I’ve expended every penny in January, that are successful themselves and would share that if I wasn’t. So I’m lucky. Remember that America, we’ve been lucky. But we can’t always rely on ourselves. We have to trust in other people, other countries, other ideas. Very cool! Glad to hear this will be taking on a more explicitly political bent. One of the most interesting aspects of this to me (and something I’ve had to wrangle with in my own life) is how generational this issue is. I think Millennials have a pretty natural distrust towards capitalism, “the American Dream,” and those sorts of things. Our disillusionment stems from our recognition that we will almost certainly be the first American generation to have less material wealth/security than our parents due to the recession. I think Baby Boomers have a lot of trouble understanding this, not only because the Millennials are their children and they have a lot at stake in their success, but also because “the system,” if you will, worked so well for the Boomers. There was well-understood path to take: graduate high school, go to college or get started on a decent blue-collar career track, and you’d end up right where you wanted to be. Nice house in the burbs, white picket fence, the whole nine yards. What they fail to realize is that it doesn’t work that way anymore at all. Personally, I’d take it a step further and argue that capitalism and “the American Dream” have always been dubious propositions at best. Nearly all the goodies and rewards of those systems have come at the cost of enormous suffering and injustice on the part of people of other races, or people in the third world. The middle class that formed in the aftermath of WWII is a historical aberration, and it only happened due to an explosion of new technologies that were able to fully exploit energy-dense resources like oil. That’s a one-time thing, and it is no surprise that the middle class is caught in a downward spiral. Capitalism isn’t geared towards creating a middle class, it is geared towards exploitation of resources and the concentration of wealth and power. I couldn’t have said it better! Thanks, Kelby… You’re so right. Great post! I look forward to the future of Moneytripping. I already think it’s an excellent endeavour so far. I’m trying myself to be one of those who is bucking the trend of capitalism and reducing my dependency on money a means for living such as growing my own food, walking/biking etc. I’m fortunate to have a safety net too but in spite of that I try to live simply so that others can simply live. Thanks for the note Tom! I’d love to hear more about you simple living if that’s alright. Maybe we can get on the phone at some point.